OMR Printing sheets are those special kind of printouts, which are used for conducting OMR based MCQ examinations. These sheets have oval shaped bubbles or checkboxes for marking the answers (as preferred by the set standards). The candidates make use of pencil or pens specified, for marking the bubbles on these sheets. This technology by the Addmen OMR makes OMR printing quite simple and usable. With the help of the OMR software by Addmen, the users get the flexibility to design or print the OMR sheets on their own. These sheets can be independently and easily printed by making use of personal laser printers. And, you would also require the A4 sheet paper for that. One will not have purchase special sheets for doing OMR printing. One can easily print these sheets at a very low cost. Using your own designs, printer and paper, you can print your own OMR sheets. The formats that are used by the Addmen OMR software has a very simple methodology, which makes it easy to design and cheaper to print. Even the cost of the OMR sheets is quite low. 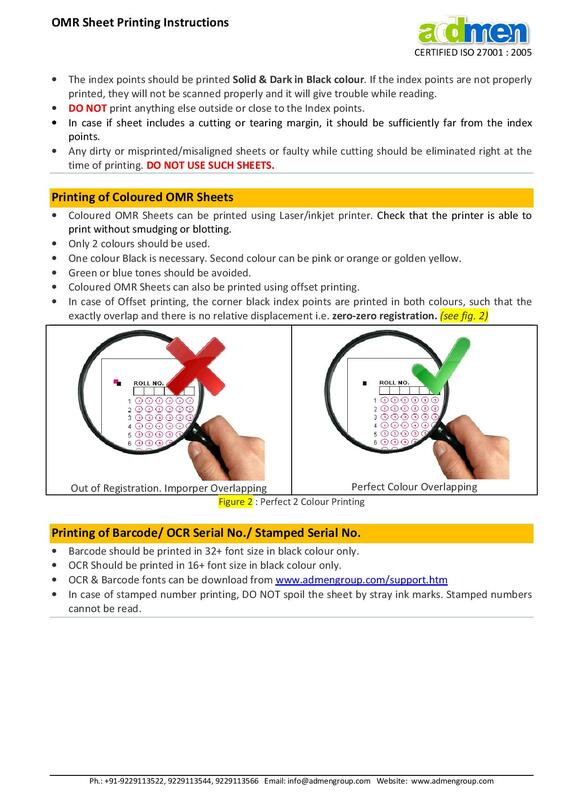 One needs to take note of the following things, while doing the printing of OMR sheets. One can make use of laser a laser printer or an Ink-jet printers for printing these OMR sheets. And, if one needs to get them printed in bulk, one can also make use of offset printing presses for getting the printing done. But, one will need to take care of some precautions and instructions for doing the printing. Any normal paper of 70 – 80 gsm can be used for printing the OMR sheets. The paper's strength should be good enough to hold the markings in the examination halls. Also, it should be strong enough to survive all the handling and logistics. Only if the paper is strong, it can be scanned and read later on. If, in case, the marking has to be done with the help of filling the bubbles, then the OMR software of Addmen can easily read the Black and White OMR sheets. But, if the marking is to be done through tick marks, then color sheet printing would be required. The colored sheets are usually printed out in two colors. One of the color has to be black and the other one can be any of the basic Pink, Water-Blue, Light-Green or yellow colors. The colored OMR sheets can also be printed on one's own, by making use of colored inkjet printers. But, one needs to be careful while doing the barcode printing, as there are more chances of barcodes becoming smudged. 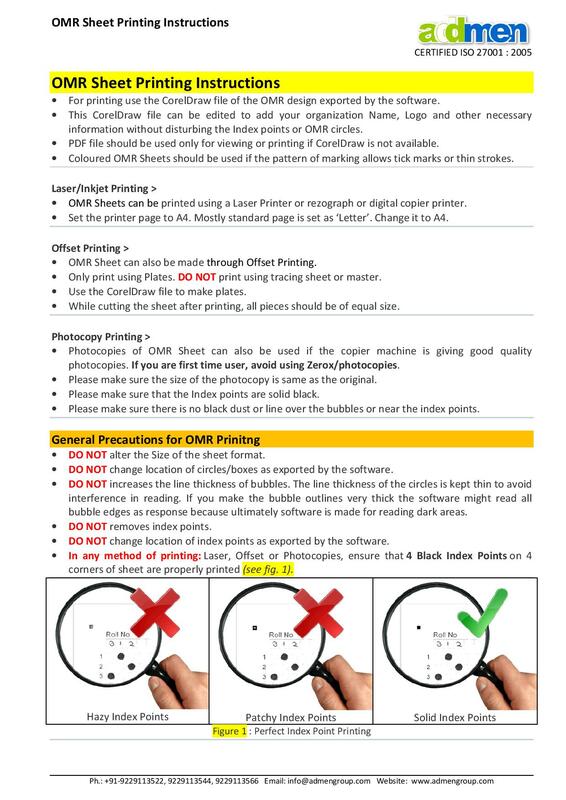 This was the OMR Printing overview for you.